We were commissioned to design a chair and an accompanying table for the event space of the new Fogo Island Inn in Newfoundland. Both pieces had to be suitable for a variety of events ranging from wedding banquets to business conferences to performance events, and also be capable of being stored away very efficiently when not in use. This all timber chair has a similar geometry to and is inspired by an old folding school chair that was historically used on the island. However rather than folding, this chair stacks vertically. 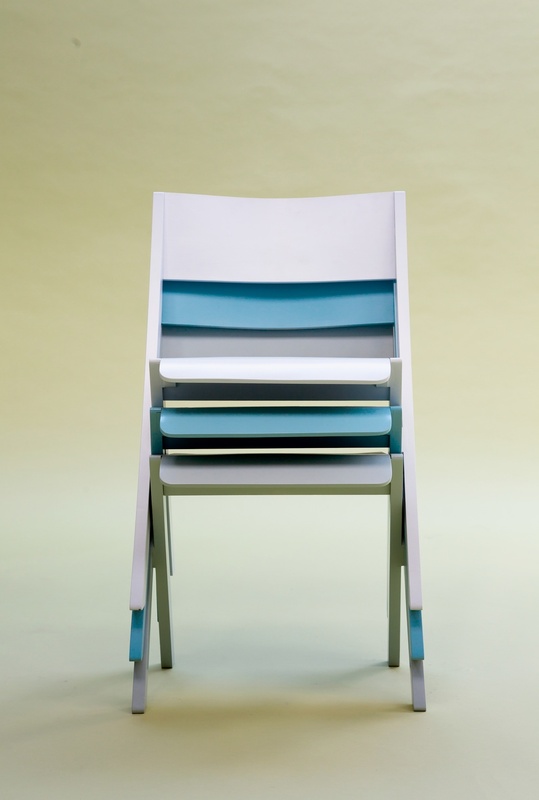 The way in which the leg joints and seat are detailed means each chair sits directly on top of each other thus creating a much more stable stack than usual and allows for a greater number to be held this way. The chairs are painted with a palette of twelve colours based on the lichen found on the island's shoreline. Cilck here for more information on the project & here for accompanying Fogo Island Inn stacking table.